Toll Brothers at Eagle Creek, a prestigious community found within Eagle Creek in Naples Florida near Lake Nona, gives home buyers seeking a resort lifestyle all the conveniences and amenities their hearts could desire. Each home for sale in Eagle Creek has an original design with tons of special features and thoughtful little extras. There are literally hundreds of options for homebuyers to choose from so each home can be personalized to fit the buyer. Many of these energy-efficient homes with their grand kitchens and spacious master suites, have gorgeous views of the golf course. This intimate gated golf community sits on 300 acres of beautiful cypress, pine and palm trees and has won multiple awards for its well-maintained grounds and their breathtaking beauty. Amenities afforded to those who buy a home in Eagle Creek include special features such as crown molding, walk-in closets, paver driveways and soaring coffered ceilings. Regardless of the day or hour, you’ll be greeted at the gated entrance by staff. Other amenities include a championship 18-hole golf course, tennis courts, multiple parks, a tot lot and swimming pool. Residents also enjoy a 9,000 square foot recreation center with state-of-the-art fitness center and additional resort style swimming pool and many other luxuries. Another advantage to buying real estate in Eagle Creek is the convenience of its location, with easy access to major highways like SR 528 and 417. The community of Eagle Creek, home to around 458 residences, was founded in 1984 and is full of single family homes, carriage homes, villas and condos for sale as primary residences or vacation homes. 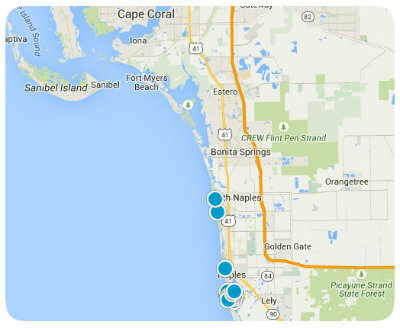 If you are looking to buy a home in Southwest Florida, Eagle Creek is a great destination to consider. Home prices range from around $250,000 to over $1 million depending upon location and amenities. The average cost is around $500,000. If you would like to live a resort lifestyle in what feels like a small town with caring neighbors, you must check out Eagle Creek in Naples. If you would like to buy a home in Eagle Creek or have other Naples real estate questions, please do not hesitate to contact us today for more information. Stonegate At Eagle Creek Bldg.